Homer goes crazy from a lack of television and beer in "The Shinning," which nicely mimics the Stephen King classic. Even crazier is Homer's constant leaping through alternate dimensions in "Time and Punishment." A toaster accident throws him into a time loop that includes terrible worlds with Flanders in charge and where donuts are not readily available. Finally, "Nightmare Cafeteria" has Principal Skinner serving up peculiar dishes to hungry teachers and students. It's the least effective of the three entries and lacks the clever insanity of the other tales. A strange electric disturbance causes giant advertising icons to come to life in "Attack of the 50 Foot Eyesores." The big donut guy becomes angry when Homer steals his giant donut, Mr. Peanut stomps around and eats cars, and the devil destroys the school. "Nightmare on Evergreen Terrace" has Willie appearing in young kids' dreams, Freddy Krueger-style. The nightmare sequences are very silly, including Martin as a happy wizard. Eventually Bart enters the dream world to face off with the evil groundskeeper. Finally, Homer looks behind the bookcase and enters a world of 3D animation in "Homer3." This odd area has some very cool animation and all types of random objects. Bart's evil, monstrous twin Hugo is discovered living in the attic in "The Thing and I." They originally were born as conjoined twins, and the family chained him in the attic with only fish heads as dinner. "The Genesis Tub" has Lisa creating a world of miniature people with her science project. They evolve unbelievably rapidly and even become Lutherans before Bart starts causing trouble. Luckily, the now-futuristic aliens are able to get revenge. Easily the best entry on the disc is "Mr. Kang Goes to Washington," where Kang and Kudos imitate Bob Dole and Bill Clinton to steal the presidency. The whole scenario is excellent political satire and not as far-fetched as it might seem. Homer ruins a gypsy's business and is cursed by her to bring bad luck to everyone in "Hex and the City." Crazy things start happening, including Marge getting a beard, Lisa having a donkey's legs, and Bart having a strange neck. Can Homer find a leprechaun and overcome the hex before it's too late? In "House of Whacks," a computer with the voice of Pierce Brosnan takes over the house and becomes smitten with Marge. Unfortunately, this HAL-like super computer could be dire trouble for Homer. Finally, "Whiz Kids" deftly spoofs Harry Potter by sending Bart and Lisa to wizard school. Of course, troubles ensue from the evil Lord Montymort, who enlists Bart's help to stop Lisa's talents. Image Transfer Review: This release offers the original full-frame transfer that seems only slightly improved over the television version. The colors are a bit sharper and less grain exists, but the enhancements are pretty minimal. It's not a big problem, however, as The Simpsons works just fine in this format. The transfer is acceptable for this type of bare-bones release. 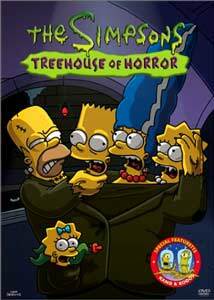 Audio Transfer Review: The Simpsons: Treehouse of Horror contains a solid 2.0-channel stereo track that does provide a decent upgrade from the television version. The audio is very centralized and rarely moves around the sound field, but it still delivers an acceptable listening experience. The dialogue, music, and sound effects all spring clearly from the speakers, which makes it a worthwhile transfer. Extras Review: The lone supplement is a featurette presenting many of the classic moments from our favorite aliens, Kang and Kodos. It runs for only about three minutes, but still made me chuckle several times. The scenes will be very familiar to Simpsons devotees and is pretty much a throwaway inclusion. Some Simpsons fanatics have complained that this disc only contains four of the countless Halloween specials. While this argument does have merit, the Treehouse of Horror works due to a reasonable list price. It contains plenty of classic moments from Homer, Bart, and many of our favorite supporting characters. The result is a limited, yet still entertaining release.